Many cultures have a variation on a hot pot dish. The idea is that you have a central pot with something hot that you cook foods in and eat. Fondue is a hot pot dish. You coat food with a hot cheese sauce, for example. In Asia most countries have a variation on this type of communal eating. 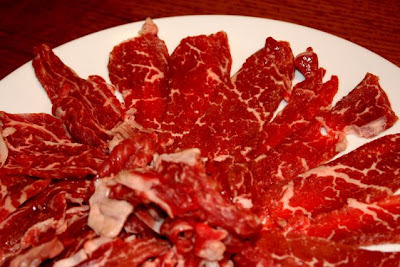 In Japan it is called shabu shabu so named for the swishing sound thinly sliced beef makes when you cook it quickly in a pot of boiling broth. There’s hot pot in China and in Korea. I love this dish. It is healthy, lowfat, and just plain fun. Often after eating the meats and vegetables, noodles are cooked in the boiling broth and it is eaten like a soup. It’s a great way to eat and we really enjoyed our hot pot dinner tonight. This one was really a fusion of styles borrowing from Japan and Korea. Here is a picture of the place setting. The sauce you see flavors the meat and vegetables after it comes out of the hot broth. It was simply made by whisking together a tablespoon of peanut butter, a teaspoon of Korean gochujang sauce (a sweet and spicy red chili sauce), some sesame oil, some mirin, rice wine vinegar and a bit of water. 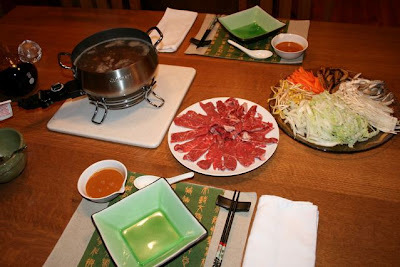 Some hot pots simply start with water and the meat and vegetables cooked in it flavor the broth by the end of the meal. I like to start with a broth already flavorful and seasoned. It makes for a more hearty and delicious meal. I started by taking some water and soaking dried shitake mushrooms in it for several hours. Then a large piece of konbu (Japanese seaweed) was added along with chopped garlic and some beef dashida powder. This was simmered for about an hour to create a flavorful broth and cook the mushrooms. I have had inquiries about the dashi powders I refer to quite often. 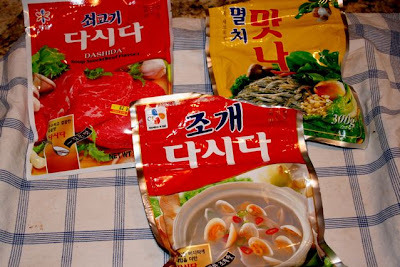 I buy Korean dashida from my local Asian market. Three staples I rely on a lot are shown below. There is a beef flavored soup powder, a clam flavored one, and a fish flavored dashi. They are great for quickly whipping up flavorful soups and broths. My hot pot this evening featured beef. I love beef. Of course you could use anything you like in your hot pot. I used a well marbled rib eye steak this evening. You want a nice cut of beef that will be tender when barely cooked. I slice it very thinly so it cooks quickly in the simmering liquid. It’s easy to slice if it is still partially frozen. Vegetables make up the greatest portion of the meal. You can use anything you like. This evening we had a lot of mushrooms. On the platter below you can see (clockwise from the top) napa cabbage, soybean sprouts, carrots, the cooked shitake mushrooms, fresh oyster mushrooms, and enoki mushrooms. The meal takes a while to eat which is just fine for me. I like to eat slowly. It’s nice when the meal forces you to slow down and enjoy it. The meat and vegetables are cooked a little at a time, dipped in the spicy peanut sauce and enjoyed with wonderful company. After the meat and veggies are all consumed it is traditional to cook noodles in the remaining broth. Tonight I made homemade udon noodles. I was greatly inspired by Kevin at Closet Cooking and followed his recipe. 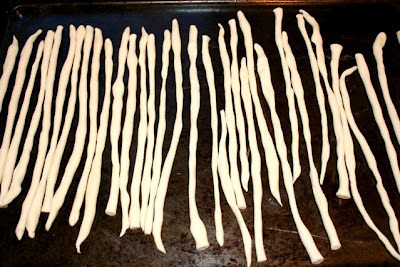 Instead of flattening the dough out and cutting into strips I rolled and stretched them out by hand into ropes and cut them. They turned out great! Thanks Kevin! 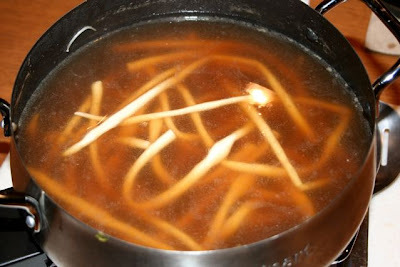 I have to say by the end of the meal the broth was fantastic with the udon. Greg, this meal is really great! Look at the marbling on your meat, and homemade udon, wooooow! 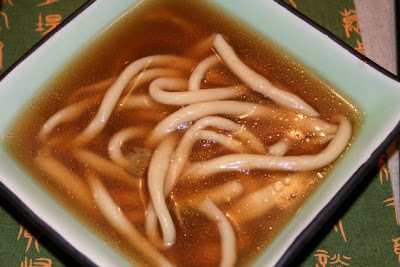 Thanks for the tip about dashi. 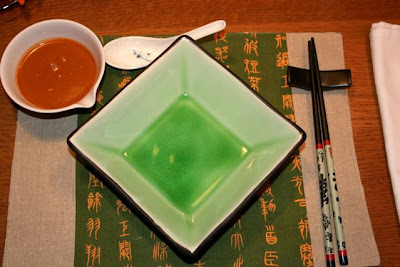 I am still looking around in Sydney for instant Jap dashi brand that I like, I am tired of making my own, even though it tastes better, because I only need to use a small amount, and so it’s not worth the hassle to make it from scratch each time. What a lovely hot pot meal. Your platter of veg is very nicely arranged too. 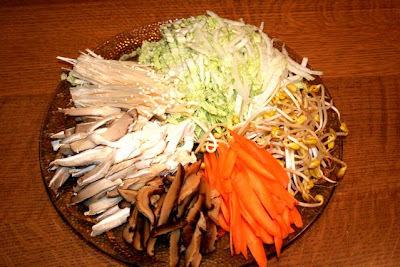 We usually leave the mushrooms and vegetables in larges pieces so that they don’t ‘disintegrate’ in the hot pot. For Japanese shabu-shabu, the freshly cooked meat is dipped in a small bowl of raw egg and then eaten. The heat from the meat is supposed to semi-cook the egg. It’s not to everyone’s taste though! That shabu shabu meal looks really good! The udon noodles look like they turned out well as well. Greg, this looks incredible! Such a beautifully prepared and presented meal… and a wonderful reminder of the importance of eating slowly, and savoring the fresh flavors of each ingredient… which is especially enjoyable when the meal is as amazing as the one you created! The noodles look great! I would like to try this soon. I have a question about your technique though. Would you explain in a little more detail how your technique differed from the original post? He rolled the dough out and then cut it into strips. What do you mean by pulling the dough into strands and then cutting? Thanks in advance for any additional info. These noodles were not rolled out flat. Rather I rolled a cylinder of dough back and forth on the counter with my hands to make a rope of the dough and just cut them to length.